There are some places that your heart calls out for, places you haven’t been but your body seems to know and yearn for anyway. For me, those are wild, mountainous landscapes of green vistas, lush hills, and pine trees. Places where nature thrives and man can only wander through her landscapes, admiring that beauty. Norway is one of those places. So when an email appeared in my inbox, inviting me on a trip to Norway to photograph the famous network of cabins run by the DNT by walking through a wilderness between, I could only say yes. It was one of those spontaneous and random things that you feel is supposed to happen to you. Thanks to my friend Hugh - who was but a stranger when that email first appeared - for inviting me on this trip to Norway and opening my eyes to a wild place that I can’t wait to see more of. 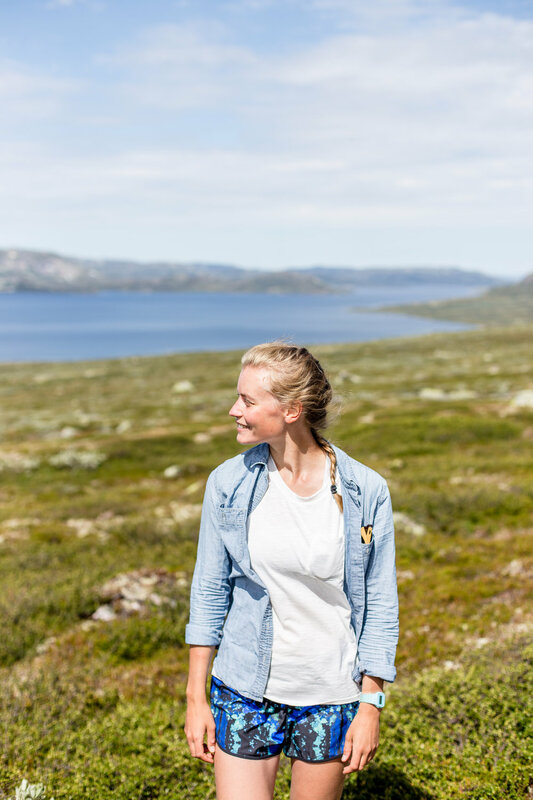 In short, our trip was five days and involved a day in Oslo, three days of hiking between cabins on the Hardangervidda Plateau, and a day to travel back to Oslo before our evening flight. For me, it just showed how easy it would be to get from the chaotic city of London and be amidst wilderness for a long weekend. I would highly recommend a trip like this if you’re craving some peace, out in the hills. 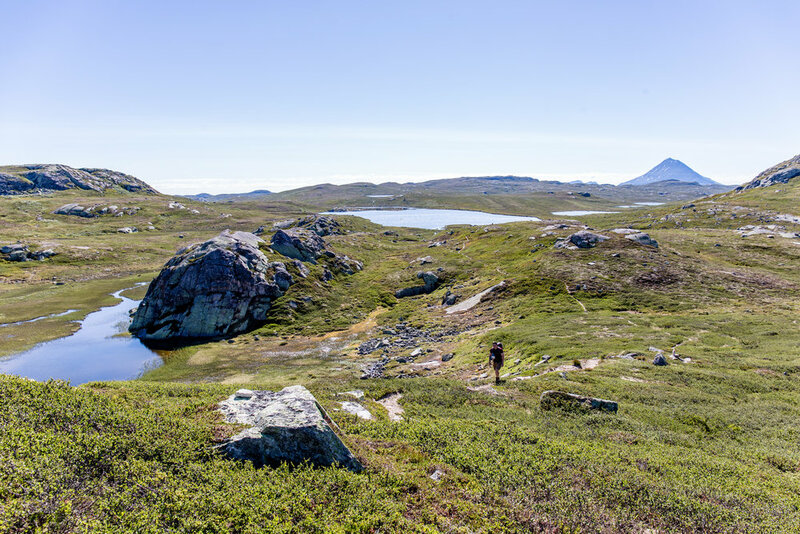 This blogpost is just a mere overview of what we got up to on our brief trip to Nordland, for Hugh’s amazing write-up and my photography, read our Mpora article here: https://mpora.com/outdoors/hiking-and-trail-running/hiking-in-norway-guide-dnt-hut-to-hut/. Our flight to Oslo was early on Thursday morning, so by mid-morning we were wondering the city and enjoying fish and chips by the water at the opera house. My first feelings of Oslo were that it wasn’t much different to a nice British city or to Copenhagen, but I was keen to see the nature that surrounded the city - what made Oslo truly unique. So after lunch, we decided to go and hike our first mountain - Kolsastoppen. Getting there involved a quick 10 minute train to Sandvikka, followed by a bus to Kolsas. From there, we followed our noses to a rough geo-tag until we found a sign for the trail (Norway love their trail markers, it would be virtually impossible to get lost out here!). 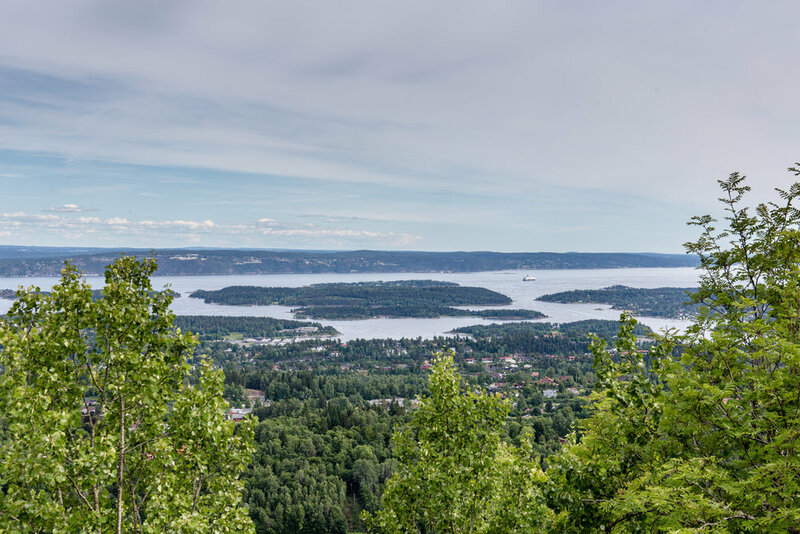 The hike is only around 30-40 minutes up through a lush, pine forest to a rocky outcrop where stunning views look over to Oslo, the Oslo Fjord and Braeman. We also saw people climbing here, which already made me really want to come back. 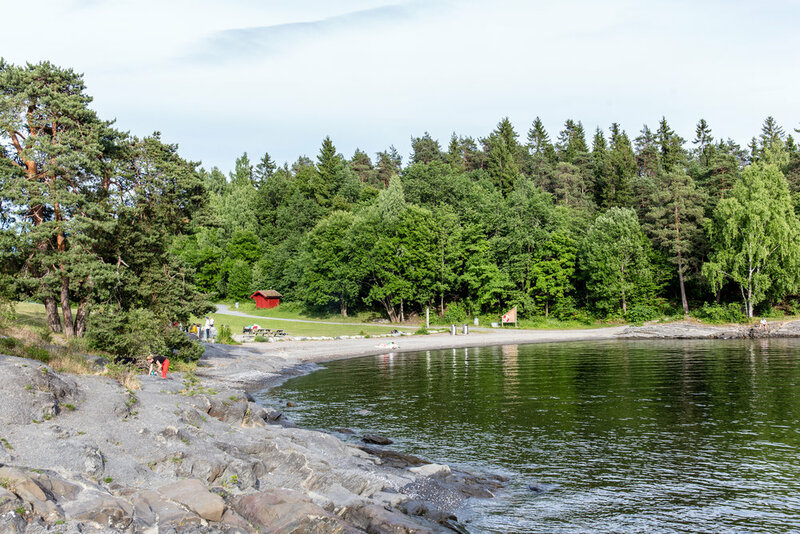 After hiking our first Norwegian mountain, we decided to head back to Sandvikka and go swimming in the fjord, at a beautiful picnic area on the island just over the bridge. The water was fresh as the sun dipped below the clouds, and I came to really appreciate how lucky the people of Oslo are to have places like this on their doorstop. I’m really not a city person, but I could see myself living somewhere like Oslo where nature flourishes alongside metropolitan life. After an early wake-up and two buses from Oslo, we arrived in the mountain town of Rjukan, the place that we would start our trek. We came across our first hurdle when enquiring at the tourist information centre, discovering that the boat and bus we would need to get back from our third and final cabin weren’t running - we were one day too early! Feeling a little heavy hearted, we decided the wisest choice would be to bypass the third cabin and stay at the second an extra night. With that issue sorted, and a quick bakery lunch in Rjukan, we set off hiking up onto the plateau. I knew that the first part of the trek was supposed to be the hardest, essentially straight up the forest on a brutal path of switch-backs. Actually, I really like walking up hills… but after 20 or so minutes our path seemed to disappear as fallen trees obscured the way, and thick areas of broken branches and bracken surrounded us. We powered on for a while, having to take off our bags to squeeze under trees and battle through shin-deep mossy ground. We were both convinced we were lost, but knowing we just had to go up we carried on heading the rough terrain for another 20 or 30 minutes. Eventually and thankfully, we spotted some people in the distance and headed straight towards them hoping they were on the right path… and they were! I can’t deny I was exceptionally happy to see a footpath signposted with the familiar red wooden markers, and after another hour or so, we plateaued above the forest. The rest of the day saw us ramble through a natural playground of flora, fauna; cloudless skies and gentle streams. We found our first hut of the trip in a golden afternoon light, enjoying being the only ones there and having a log cabin in the hills to call home for a night. After porridge and coffee the next morning, we set out for our second day of hiking. The hike was peaceful and deserted, we saw probably only six or seven other people the whole way to the next hut. Passing lakes and hills, an abundance of wildflower, cabins and breathtaking vistas. Though it was a long, hard hike, what I remember when I think back today is the views we had and the calm we felt. I think the photos speak for themselves here. Arriving at Kalhovd felt like a bit of a wake-up from a tranquil, hill-walkers daze; seeing the cars parked outside and the gravel road leading in, we knew we would be leaving the wilderness for somewhere more inhabited. 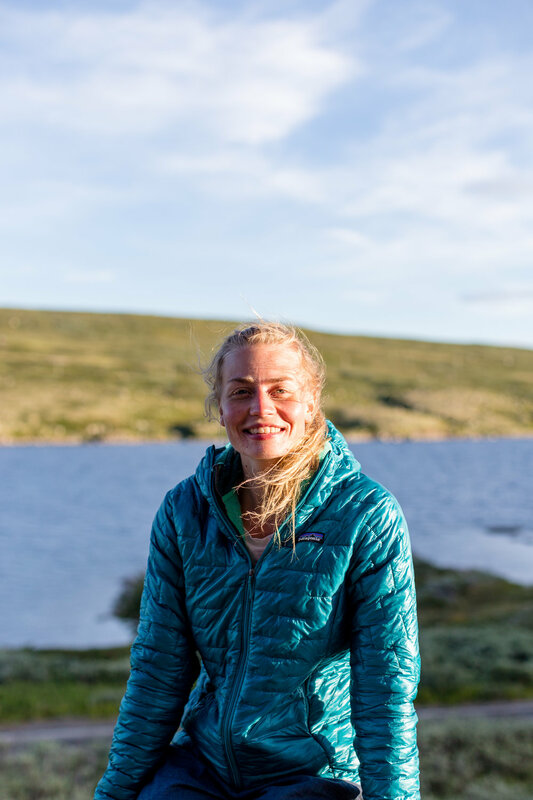 Actually, it was an amazing experience staying at Kalhovd; enjoying a delicious, home-cooked Norwegian dinner, speaking to interesting and friendly people who had made their way to the cabin by foot, car or bicycle, and watching a beautiful sunset over the hills and lake outside. As I explained, we decided that we couldn’t head to the third cabin of the trip as we would have no means of getting back from it, so on our final day in the hills we planned a circular hike from Kalhovd, taking in some of the route that we would have walked, and views of the lake on the way back. Everyday so far had been cloudless and blue, but it was actually a treat to wake up to a more cloudy sky today. Partly - I was thinking - because it would add some variation to my photos. The hike through the hills was wild as can be, but I actually loved heading over to the fjord and enjoying a relaxed lunch with our feet dipping in the freezing water. We walked along the gravel road back to the hut, and that evening stayed up to watch the midnight sun dip below the hills - a Norwegian sunset I won’t forget. The following day we hitched a lift out from Kalhovd and made the long journey back to Oslo. 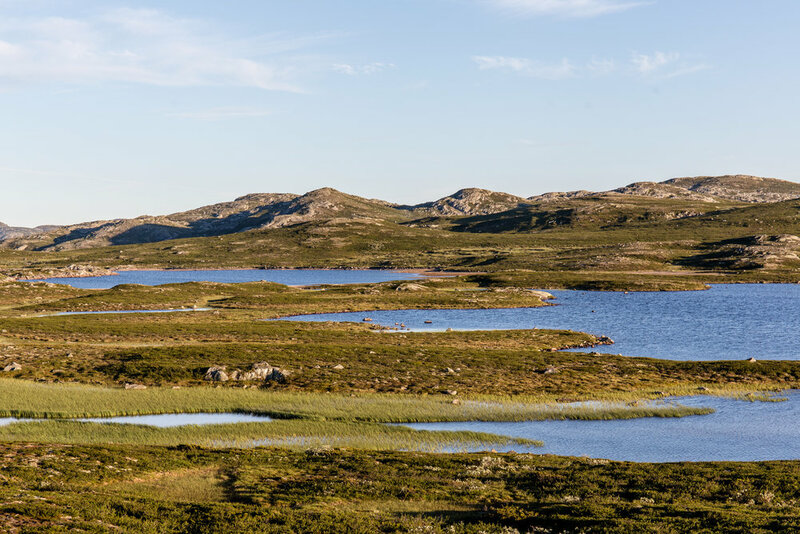 Going from the rugged hills of the Hardangervidda Plateau back to the busy streets of Oslo and then London was a mild shock to the system, but it also made me appreciate how easily we can get into the wild if we want to. 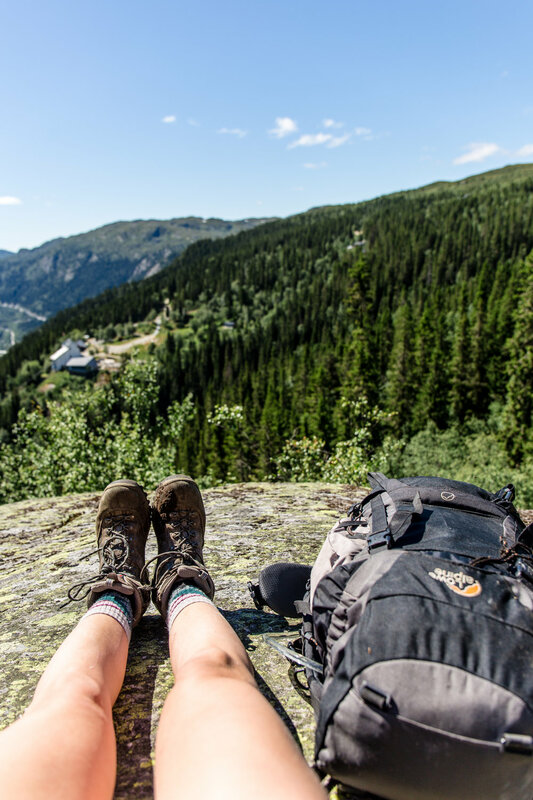 This trip was supported by Visit Norway and the DNT thanks to the article we wrote for Mpora, but if you want to do this trip yourself, it’s super easy and would be relatively cheap if you wild-camped (legal in Norway!) enroute - although I would recommend at least one night in a cabin for the true Norwegian experience. Thanks to Hugh for a great trip, Visit Norway and the DNT for helping us out. Don’t forget to check out the article here.